Part of the cast for Anne of Green Gables get into character. It has been half a century since Anne of Green Gables first opened in a Charlottetown theatrical performance and now, for the first time this February, the play will be performed by the Rossland Light Opera Players (RLOP) in venues located in Trail and Rossland. The RLOP have not performed a major musical in the previous two years and since the fall of 2013, have been working towards this Canadian classic based on the 1908 novel by Lucy Montgomery. Marnie Jacobson of RLOP has always wanted to bring the Prince Edward Island story to life in Rossland and presented the idea to the RLOP executive committee over two years ago. Back then it was considered too expensive due to the royalty fees. Since then, RLOP member Karen Yamazaki was able to negotiate royalties, cutting them in half to bring a little piece of Canada’s operatic history to the Kootenays. “It just made sense to do a Canadian play,” said Yamazaki. It was Canadian comedian, actor, director, journalist, author, playwright and composer Donald Harron who originally adapted the story for the stage. Sadly at age 90, Harron passed away in January of this year, making the timing for RLOP to bring this show to a local audience even more felicitous. Set on Prince Edward Island, the performance guides the audience through the adventures of Anne Shirley, a young red-headed orphan mistakenly sent to brother and sister Matthew and Marilla Cuthbert. The Cuthbert siblings, who never married so now live together, intended on adopting a boy to help with farm duties, but were instead sent Anne. Producer, Patricia Senecal has a large role in bringing this show to life. She has a role on stage as well as behind the scenes. “I am very passionate about the play; my mom was born in Prince Edward Island,” she said. This light hearted entertainment is for all ages with 28 musical pieces performed by a full orchestra. The music is snappy and the dialogue witty. 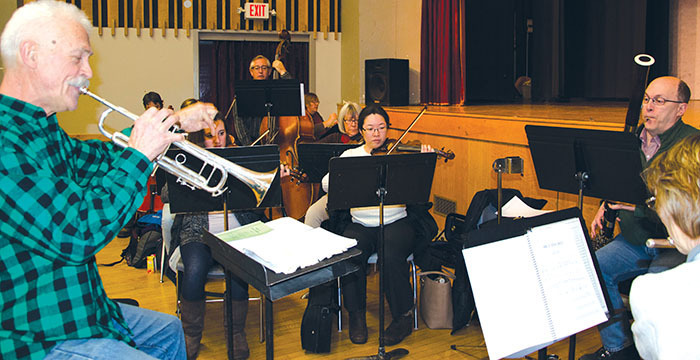 “To be in a place like Rossland, so far away from a big city, it is great to be on stage singing with a live orchestra,” said Senecal. “The play appeals to everyone from kids to seniors, it is very well rounded that way,” she added. There are about 35 cast members from throughout the Kootenays on stage plus an additional 15 to 20 back stage crew. “Some characters have three or four costume changes,” explains Senecal. The show opens at the Charles Bailey Theatre in Trail at 7 p.m. on Friday, Feb. 20. It then continues Saturday, Feb. 21 with a 7 p.m. performance, and Sunday, Feb. 22 at 2 p.m. The show then moves to the Rossland Summit School (RSS) for 7 p.m. shows on Friday and Saturday, Feb. 27 and 28. Tickets are now on sale and can be purchased from the Charles Bailey Theatre box office. Trail shows ticket prices: children $15, adults $20. In Rossland from Tails Pet Supplies, on Washington Street. RSS show ticket prices: children $10 and adults $15.